Home > Archives > Celebrate the Century Express. The U. S. Postal Service special Celebrate the Century Express train took a two-year tour of the nation from 1999 to the fall of 2000. 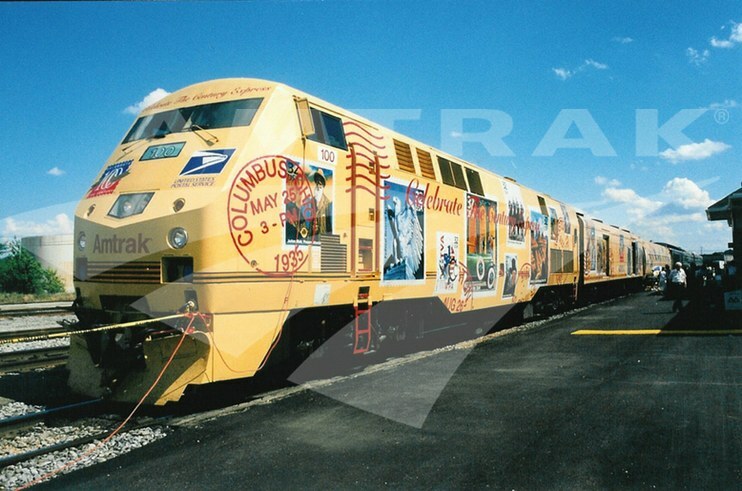 The paint scheme adorned the outside an Amtrak P42DC locomotive #100, a baggage car, and an Amfleet car with a modified interior. This scheme consisted of a very elaborate collection of enlarged stamps and postmarks from the 1900s to the 1990s. Photo courtesy of Todd Stennis.